How was your Thanksgiving? Did you eat ALL the things? How many kinds of pie did you have? My Thanksgiving was actually pretty low key around here and I loved it. My parents came to visit and we made a lentil loaf, lots of mashed potatoes, and topped it all off with generous slices of my favorite peanut butter pie. I love the balance of hosting Friendsgiving the weekend before (cooking and hosting all the people) and having just a few of us together on the actual holiday. I also received an Instant Pot as an early Christmas present, (thanks mom and dad!) so I’ve been enjoying playing with it the last few days. 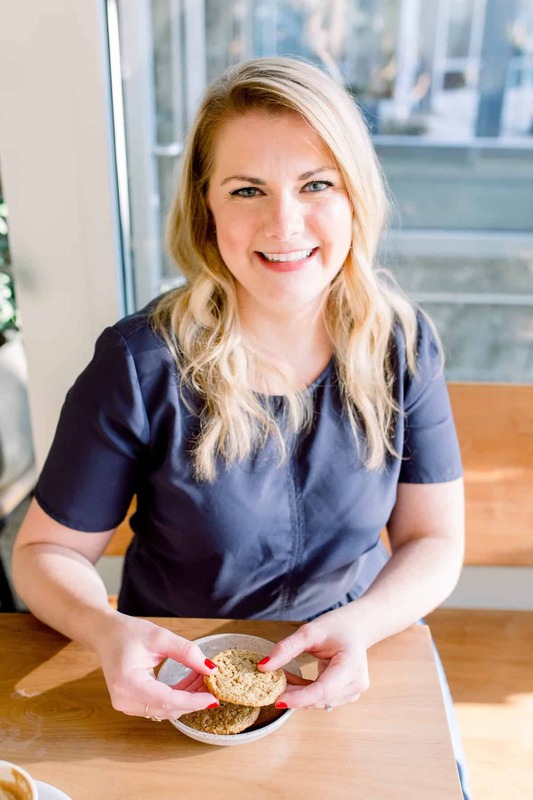 I know not everyone has one, but would you be interested in seeing Instant Pot recipes on the blog? I think I want to conquer a coconut milk yogurt in the Instant Pot, but that’s going to take a few tries. Anyway, on to the best way to use up some of your Thanksgiving extras, sweet potato oatmeal! Regardless of whether you hosted big or small, this week or last week, you probably have a whole fridge full of leftovers. I know we have been eating mashed potatoes for days (no complaining here), but I know that eating the same things over and over for dinner can get old really fast. the two things I always seem to struggle with using up after Thanksgiving are sweet potatoes and cranberry sauce. I obviously don’t eat turkey, so I never really know what to do with leftover cranberry sauce. It would go well with a smoothie, but I tend to stop craving those as soon as the temperature drops below 50 degrees. In my opinion, the next best breakfast staple is oatmeal! To be fair, this recipe is for steel cut oatmeal, but really sweet potato oatmeal can be made from either. The main thing is that you get to use up those leftover sweet potatoes and it’s for something other than dinner, score! 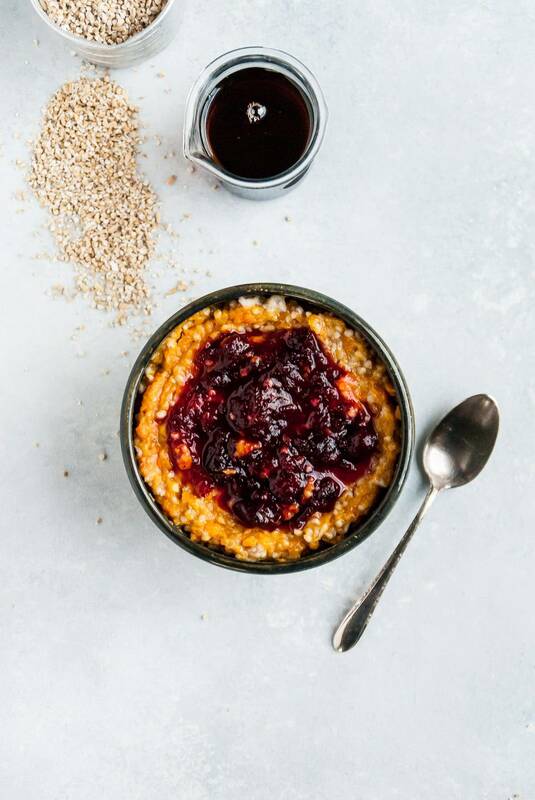 I know sweet potato oatmeal seems a little odd, but trust me, it’s so good! It’s also a great way to pack in some extra veggies in the morning and jump-start the day. I usually eat oatmeal or steel cut oats when I get into the office and I’ve found that it holds me over until a normal lunchtime. As for the leftover mashed potatoes? I think those are best eaten straight up, right out of the bowl. 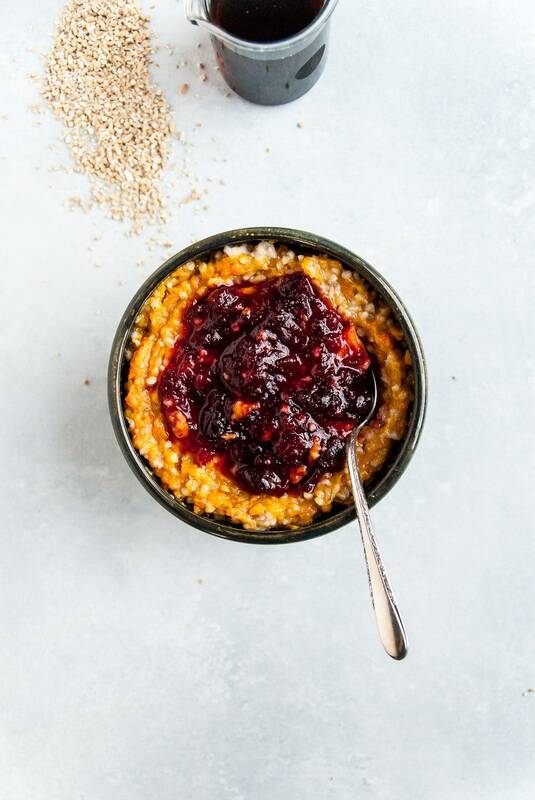 The perfect way to use up Thanksgiving leftovers, this vegan sweet potato oatmeal is topped with cranberry sauce and perfect for prepping ahead! 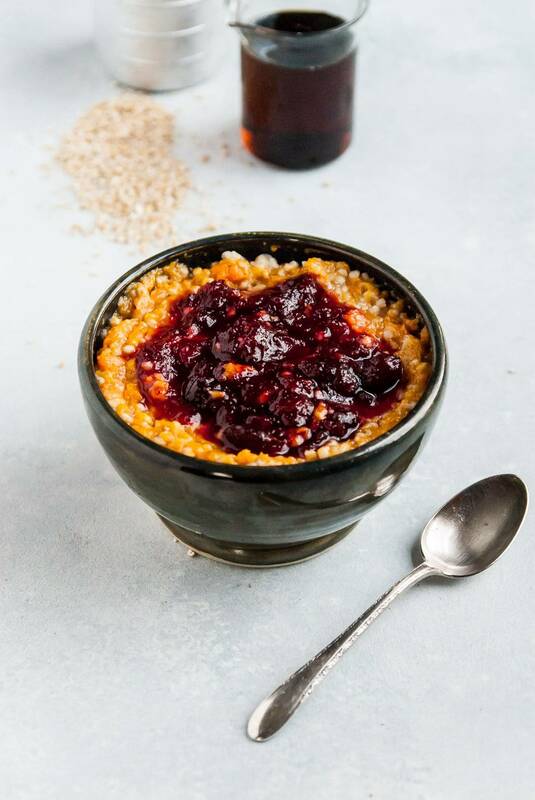 To prepare the steel cut oats: Combine the steel cut oats, water, and salt in a saucepan over medium-high heat. Bring to a boil and then reduce to medium-low heat, keeping the oats to a simmer. Simmer for 15-20 minutes, depending on how chewy you want the oats. After oats have cooked, stir in the cinnamon and ginger. Add in the cooked sweet potato and combine until smooth and sweet potato is stirred in. Top with cranberry sauce and maple syrup. Serve immediately. This oatmeal sounds so good! Shockingly, we had almost no thanksgiving leftovers and I was actually kind of sad about it. I mean, it meant the food was thoroughly enjoyed, but now I am going to have to remake some sweet potatoes and cranberry sauce to whip up this yummy breakfast! Ahh no leftovers?! So sad! I know, I’m excited to use it! Wow! I may never eat plain oatmeal again! How creative!